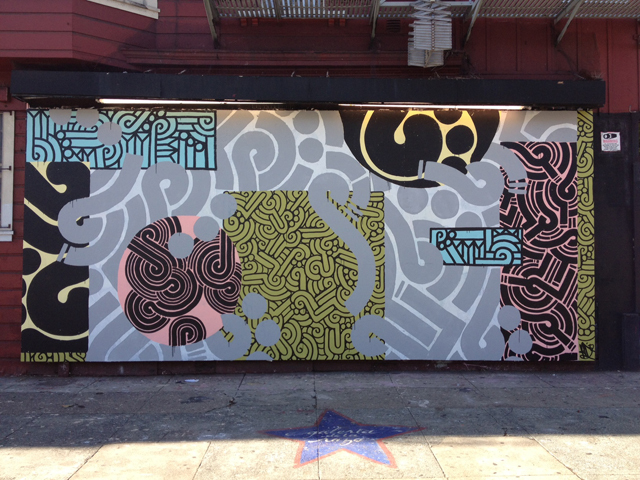 The design for this wall was influenced by the number 42 – the number of years Galería de la Raza has been operating in the Mission District of San Francisco. It was also influenced by a conversation with Galería’s Director, Ani Rivera, who shared with me a little bit about the neighborhood’s history and the current advocacy being taken on by the cultural institutions along 24th Street trying to keep and maintain the cultural landscape that has defined the lower 24 th Street as a historical cultural corridor. In creating this piece, I wanted to translate my understanding of the neighborhood and bring voice and visibility to the diverse communities living in the neighborhood and how these communities intersect or not with one another. The gray palette and primary design represent the earth and the current land this neighborhood stands on. I wanted to work in a process where I started off with a primary design as a base; where if I stopped, the design would feel finished. I then purposely added bright and colorful geometrical shapes on top of one another to symbolize the intersections of communities in the Mission District. In finalizing the piece, I brought back the original gray design and covered over the geometrical shapes to remind us of the foundation that will forever be engrained in the footprint of the historical 24th Street corridor. In total seven designs (a multiple of 42) are revealed in this piece to commemorate Galería de la Raza’s work and its contributions to the residents of the city of San Francisco. His work finds strengths in the reduction of his interests in life to minimal information.